After 30 years of being a practicing Chiropractor and treating a number of strains and injuries, George Hickson saw a need for a junk removal company in the Golden Triangle area. He believed there was a large number of people and businesses that just didn’t have the time or the ability to remove their unwanted junk themselves. These same people want it done now!, says George. He adds, “this is where Junk Works Golden Triangle takes over. We can do these jobs that they can’t or are unwilling to do. We can do it fast and in an environmentally friendly manner. We also, recycle and donate everything we can. People want that and we deliver. Junk Works Golden Triangle opened its doors in the spring of 2013. They provide service to Kitchener, Waterloo, Cambridge, Guelph, Stratford, and the surrounding rural areas. Having been a chiropractor, George saw many patients with injuries from the result of do it yourself projects. He also saw an aging population that just couldn’t move their junk without consequences. Having professionals available to remove the stuff provides a service to prevent these injuries. His trained team removes heavy items like: appliances, mattresses, refrigerator/freezers, hot tubs, e-waste, garbage, decks, and fences. George believes that the biggest proof that his Junk Works Golden Triangle is good at what it does is it’s ability to acquire and keep repeat customers; as well as, to develop a growing base of referral customers. He states, “I truly believe that there is only one way to take care of business and that is to take care of people. If you are in need of George’s Junk Works Golden Triangle team, call 1-888-888-5865 (JUNK) or book online. Is your home or business becoming too cluttered? 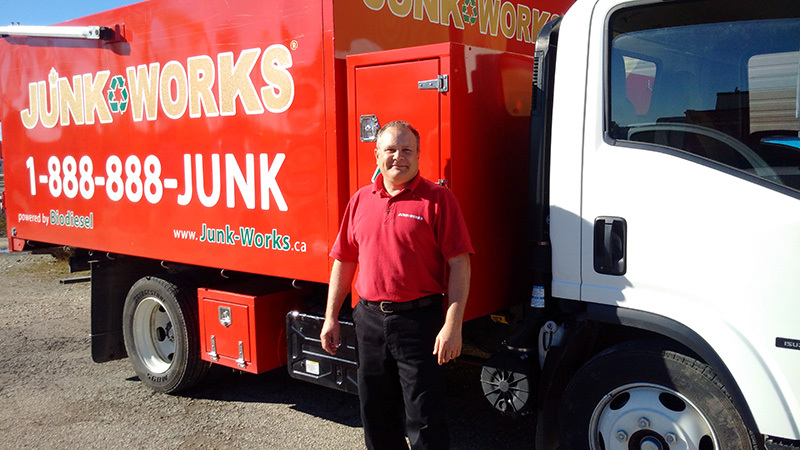 Junk Works™ provides reliable junk pickup service in the Golden Triangle area. Our staff can take care of the junk hauling for you. We're conveniently located near the Golden Triangle area, and can be at your home or business quickly! You can have piece of mind knowing that your items are disposed of properly since we recycle up to 60% of everything we pick up. Watch the video and see the #1 junk removal company at work. Junk Works also appears in episodes of TLC's Hoarding: Buried Alive. April 03, 2019 by A.S.
March 12, 2019 by G.B. February 28, 2019 by S.J. E-mail confirmation, phone call confirmation, moving the furniture. I also liked that the supervisor made the safety of his employees a priority. I also liked paying by VISA. Good service!